First off, I want to say a big "Thank You" to everyone who has been reading and leaving comments! I write this blog for myself, but it's nice to know I'm not too boring or crazy. Are you wondering why in the world I waited until the day was over to clean our bedroom? Well, partly because I'm a night owl and I get my burst of energy around 3 p.m. Today was no exception. But before that I had a full day in the city. Today was the huge garage sale in Lincoln at the Event Center. Rick worked for a few hours this a.m., early, and then came home at 7 a.m. to go with me. He felt bad that my "real-life" friends & family couldn't come along and I was going alone. I told him I didn't mind, but it was nice to have company. He may not "get" my addiction to quilting, vintage kitchen things or my blog, but he's still my best friend. We got to the venue after the rain stopped, but the parking lot was a mucky mess! Yuck! Once inside it was quite crowded, but we made our "plan of attack"... make the circuit around the outside edge and then the inner booths and then work the inside rows the same way. That was the only way to preview the booths and watch for other shoppers. About 3/4 of the way down the second row I spotted it! "What was 'IT? '", you ask? 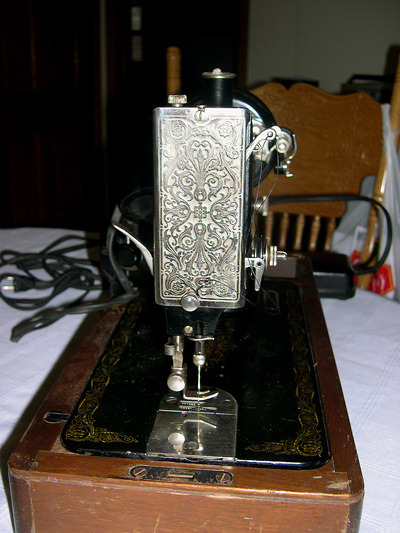 I know very little about old sewing machines. I only have a 1980s Kenmore that I use for my quilts and a Bernina that needs some work. The Bernina was purchased from the publisher of the newspaper I used to work for. I got it for $25 w/ the cabinet. I just need to get it somewhere and worked on. It sat in a damp garage for too long, I think. Anyway... 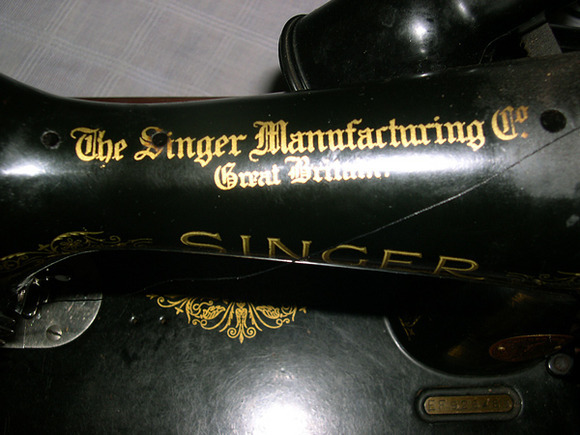 I don't know a thing about old machines, but I was excited to see "Singer" printed on this one. The gentleman selling it was very nice but I wonder if he knew what he had? He did make the effort to find an outlet so I could try it. It works! It seemed sound, smelled ok, and I didn't see any glaring flaws. It has the case and the key, but no manual or other accessories. I was able to "haggle" him down to $35 (from $40-- whoop-de-doo! ). 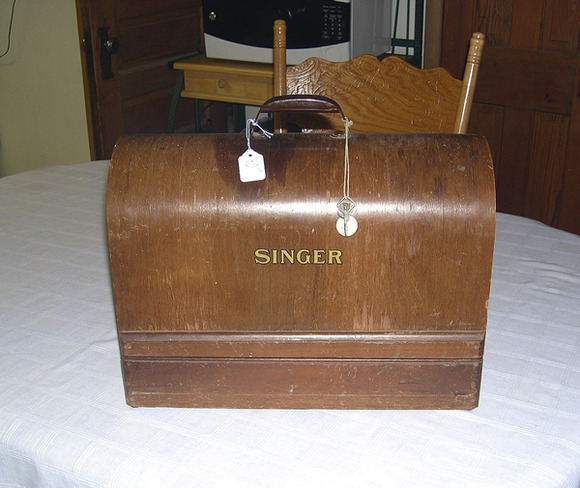 An online friend pointed me to a Singer Yahoo group and I think what I have is a Singer Featherweight 99k, made in Great Britain in 1949-50. (Later Note here: It is NOT a Featherweight, but just a 99. The "K" means it was made in Great Britain. 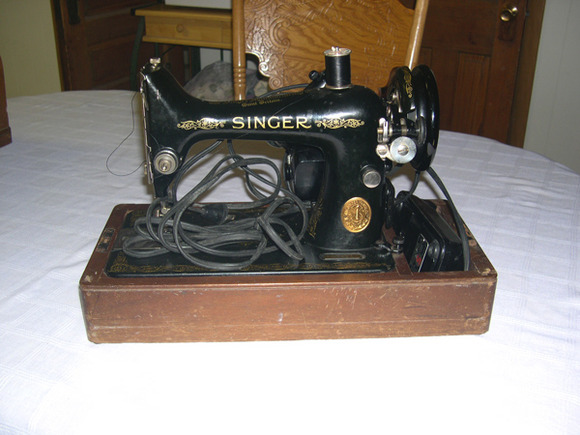 Owning a Featherweight has been a longing of mine ever since I got back into quilting. That and owning a new, fancy-dancy Bernina or Pfaff or Huskavana. I figured neither were in my future because of price. I've only seen a couple of old Singers at auctions and they always went sky-high out of my price range. And of course the new sewing machines are out of that range too. We completed the deal and the seller agreed to keep it at his booth while we continued on. 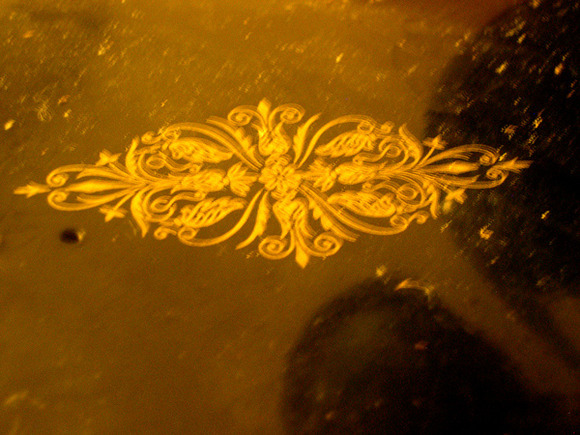 There was everything from JUNK to nice antiques. I looked at a few quilts but they were pretty damaged for their price ($50-$100). I've gotten "cutter" quilts that were as nice for alot less. 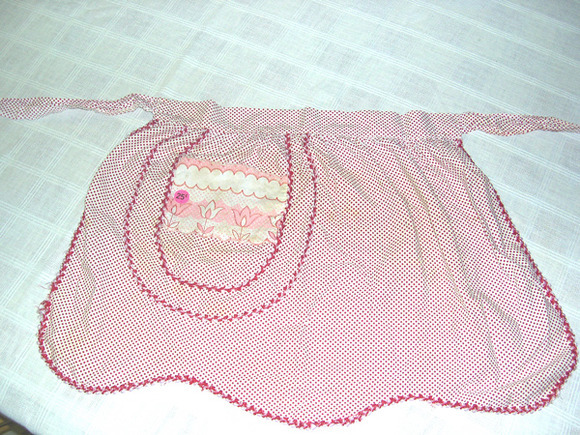 In the end I only found this sweet vintage apron for... get this! 25¢ !! I have to find a way to display my growing collection of aprons. I got one at the thrift store again this week... a turquoise and white one. Hmm-- did I take a photo?? Well, if I did, I've deleted it. I'll take another one of my finds that day....books and that apron and a sweet violet china/porcelain basket. Getting back to today's adventures.... It took us about an hour & a half to get through the sale. We picked up my machine (heavy thing it is, too!) and made it back through the hog-wallow of a parking lot. They told me about the famous doll-maker, elinor peace bailey, who was there for a week-end class. They offered to introduce me to her. Now how nice was that?! I declined because I didn't want to take her away from the class, who had paid for the privilege of her teaching and time. But I still thought that was more than sweet. Of course you know I had to buy something there. 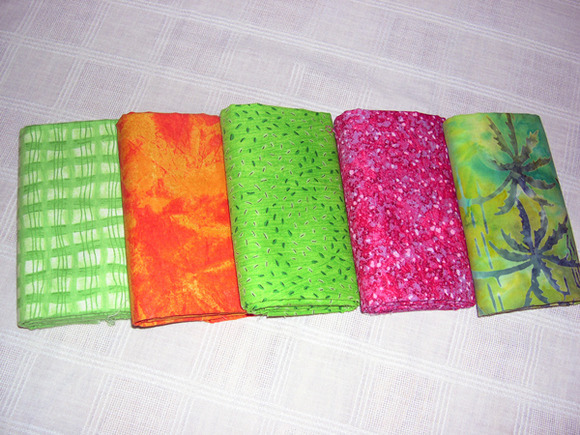 These are going into the "It's 5 O'Clock Somewhere" quilt collection for our online home party in a few weeks. Obviously I was a little color-starved on this early spring day in March. After I spent the last of my money, we went to Earl May Garden Center to look at lilac bushes. We are making plans to dig out some cedars and open the view to the pond. I thought lilacs would hide the yuck-looking cattle pen but let us see to the pond still. We got a lot of helpful information from "Josh". We'll be working on that project a little later in the spring. From there we went to lunch, then home for a nap for Farmer-dear and online detective work on my new toy, for me. And that is why I was cleaning the bedroom at 6 p.m. and why the laundry has just stopped at 11:45 p.m.